At a guess, Arca-Swiss 5×4″ monorail camera and Linhof Angulon 90mm lens for somewhere between 10 seconds and 3 minutes. Fujichrome 50. I’m not sure whether I arrived on Fraser Island by plane or boat, but I think by plane. Either way, I was met by one of the keepers who drove me to the lighthouse along the beach below the high water line. On the way, he told me of the frequent sorry end of many visitors who drove along the beach. The surface appeared to be firm, level and safe so some drivers drove quite fast. The trouble was that there could be washaways where creeks ran out on the beach and these could appear to the driver with little notice. Consequently, visitors would regularly pile their four wheel drives into little sand canyons and often they would not be able to extricate the vehicle before it was claimed by the sea. 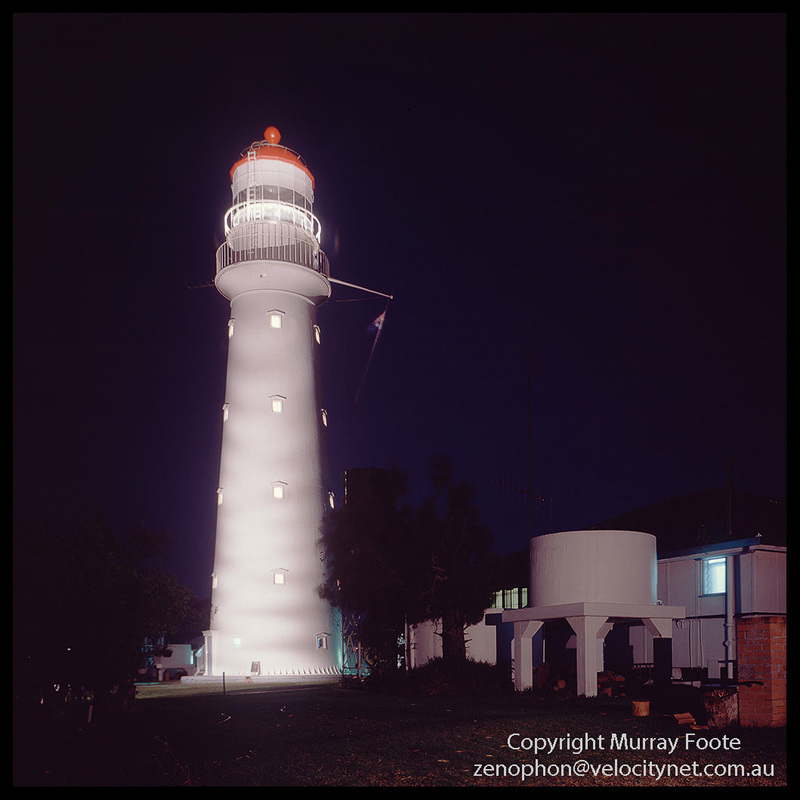 I think this was the first Queensland lighthouse I visited in which case it would be late May 1987. At this time the corrupt and repressive Joh Bjelke Peterson government ruled the roost in Queensland. Never having been to Queensland before, I was thinking I would have to be very careful of what I said but I was forgetting the Joh ruled only due to a gerrymander and his National Party received less than 30% of the vote. The Fraser Island keepers probably voted Labor and in any case I didn’t have to mind my tongue and we got on fine. Probably Nikon FE, 16mm f3.5 fisheye lens, Fujichrome 50. 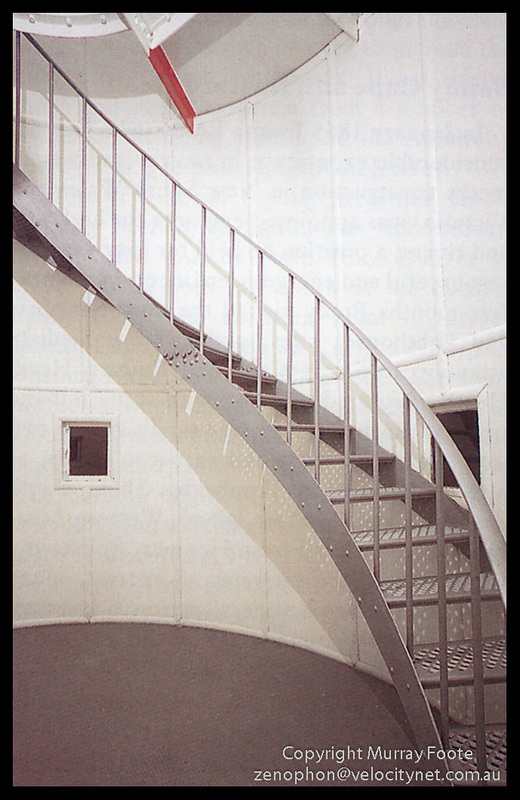 The cast iron circular staircase. The red beam is just a warning for heads. Sandy Cape was one of only two all-metal lighthouses in Queensland. It was built in 1870 and is twenty-six metres high. Nikon FE with 16mm f3.5 AI fisheye lens, Fujichrome 50. 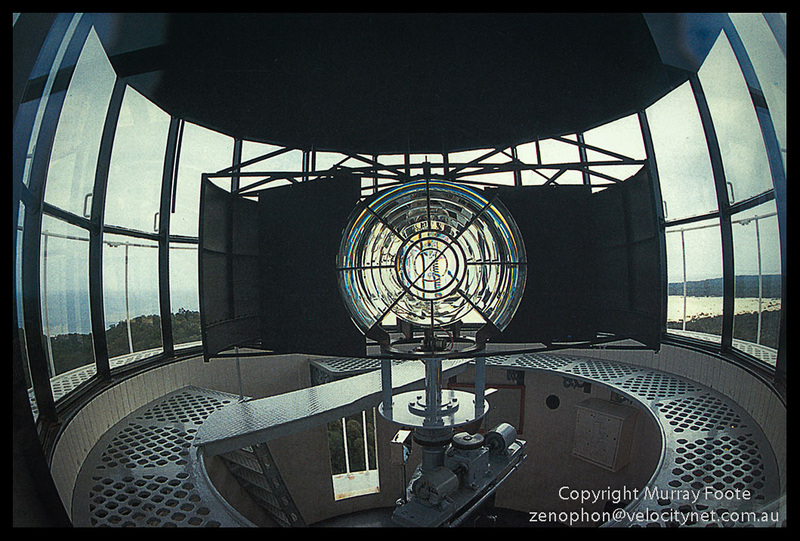 Here is the small, fourth-order optic of the lighthouse. 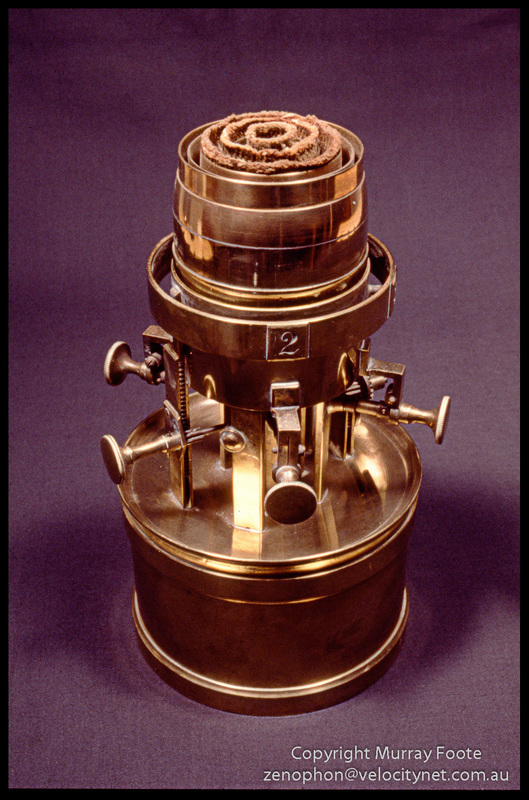 Originally the light source would have been a kerosene lantern, the lens array would have sat in a bed of mercury and a clockwork mechanism turned it. Over the years this was upgraded. Here there is an electric light behind the prism and an electric motor turns the light. Probably, Nikon FE, Vivitar Series 1 28mm f1.9 lens, Fujichrome 50. Here is a kerosene lamp that I presume would have been the light source for a nineteenth century lighthouse, though I don’t know which one. The middle left knob has a ratchet so that must be to raise and lower the three wicks. Perhaps each wick sits in a separate brass doughnut and the other knobs allow adjusting the supply of kerosene to individual wicks. We can see the numbers 2 and 3 engraved on the side so there was probably a number 1 for the other knob (and wick). This entry was posted in Australia, From Dusk Till Dawn and tagged Architecture, Australia, Fraser Island, History, Landscape, Lighthouses, Photography, Queensland, Sandy Cape, seascape, Travel.